The access to our site www.radiomodelli.com and its usage, as like the products and services, are subject to the following conditions. When using our site, you accept the conditions of use. These are subject to periodic amendments and modifications. We therefore suggest you to, regularly visit our T & C. This is to be up to date with all the eventual changes in our Conditions of Use. At this very moment, the access to the site is open to all. But we reserve the right to, at any time, restrict access to the fruition of certain services. We are not to be held responsible, for whatever reason, should not be possible to access Radiomodelli by Ethnik for a certain period of time. We reserve the right to restrict access to some areas or services of the site. Radiomodelli by Ethnik should therefore not be held responsible for damages or losses caused by the wrong utilization of info within the site. Certain links within the site are taking the customer to sites outside our control and realms of responsibilities. Whether partners or non-partners of Radiomodelli by Ethnik they are always separate entities. By clicking on these links you effectively leaving Radiomodelli by Ethnik, and so outside of our control or sphere of influence. Further, Radiomodelli by Ethnik dismisses any responsibility once the site, our site Radiomodelli by Ethnik is left by clicking a link. To order and purchase from Radiomodelli by Ethnik, we require and assume, that customers are over 18, and that the customer is obliged to supply always correct information of him/herself. Radiomodelli by Ethnik guarantees the data protection act. These shall not be made available to third parties or for the purpose of ‘external’ bodies’ marketing. While processing your order , it is plausible that your details such as; address, VAT registration (where applicable), postocode (or zip code in US). They could be transmitted to to control bodies but only in the attempt to prevent fraud or/and fraudulent behavior by looking at certain trends. Your data’s update: You can verify any time, 24/7, the data supplied to us at Radiomodelli by Ethnik by contacting us via e-mail or through our customer service, the latter though, is not 24/7. It will be requested from you a proof or proves of your genuine identity, obviously, before communicating to you the info requested. We could ask you your e-mail or password (in case of a phone call), or your nick name with which you are registered with Radiomodelli by Ethnik. You should use few rules of common sense; keep this info safe, cause the responsibility of anything that happens to the site, Radiomodelli by Ethnik, is only yours. We strongly suggest that you don’t memorize these details mentioned above onto your browser as this is not safe at all, just in case other people may have or gain access to your computer. Security at Radiomodelli by Ethnik: We are using one of the “state of the art” program for managing data on line safely and securely. We continuously improve and update our software and servers. This makes the shopping experience at Radiomodelli by Ethnik always as secure as it can be. All the content accessible on Radiomodelli.com is exclusive Intellectual Property, copyrighted, protected by Licenses, laws and agreements valid worldwide. Allof the above are propriety of Ethnik and, where applicable, to its suppliers. Therefore, the contents of this site can be used; printed, saved, or presented ONLY FOR PERSONAL REASONS. It is against the law to make a commercial use of such contents; the website in its entirety. Makes exception to this rule if ad hoc agreements are made with our agreement and written permission. It is strictly forbidden to manipulate, publicize, distribute and reproduce, in any form or by any means and/or media (audio, video, picture, text, e-mails) the content of www.ethnik.it. This is applicable to commercial, entrepreneurs and public or private associations, of any type. 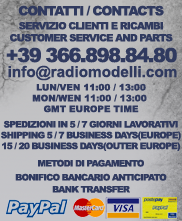 Radiomodelli by Ethnik can make consignments Italy-wide, Europe. The carriers (but at times we may be required to use couriers) that are in agreement with us, consign parcels, of all sizes, from Monday to Friday from 8.00 AM to 7.00 PM. For payments using money transfers or wired transfers, is requested one day, as the sum is accredited and be visible on our bank account. Radiomodelli by Ethnik will post the goods only after having received payment. In case of Italy and other countries, consignments will be handed to carrier the next working day, after your order. But thi applies only if the order is pushed through before 3.00 PM, and only if the chosen payment method is Paypal, Credit or Debit card. Obviously, if the method of payment is the money transfer through a bank, then, as said above, there is a one day delay. This is simply due to the fact that we await visibility of reception of payment. Times of delivery may vary. Generally and usually it takes between 5 and 7 days, but sometimes and so far not very often, these times may vary for reasons beyond our control. However, assuming the transport part goes smoothly as it does, the carrier will make the first attempt at your chosen address. If you are not at home it will leave an “attempted delivery” ticket. The carrier will then attempt to make a second delivery, and, if it fails again, you will find, once more, a ticket of “second attempted delivery”. This will give you all the details “how to claim your package” which tells you where, when and all the details necessary to get your parcel. Or better, it will contact you, provided it has your phone numbers. Radiomodelli by Ethnik accepts the following methods of payment: Credit and Debit cards (Visa, Visa Electron, Mastercard, Maestro), Paypal, Money Transfer, plus other that shall be agreed between the two parties (by contacting us through the Customer Service). Paypal site can be accessed via the link www.paypal.com. There you can obtain all the information regarding their services. All the prices you see on display on the site are all with VAT included (when applicable) to the current rate. Credit / Debit card verification: the customers that intend to use credit or debit cards are subject to the “authentication” process; basically it is request an authorization from the card issuer. In the unfortunate case that the card be rejected, our system will immediately tell you at the moment of the order’s conclusion. On verifying your order’s request, it is possible that your details such as address, postcode / zip code, VAT registration, etc, could be forwarded to third parties for security reasons. This is to prevent frode and wrongful doing. To protect you and us. It is possible to cancel an order only while it is “in process”. This means that goods are not yet been packaged or posted out of our warehouse. To do a cancellation you have to follow a very easy procedure and contacting which are very clear throughout the website Radiomodelli by Ethnik. We always strive; endeavor to guarantee that the details, descriptions, and the products’ prices on our site are correct, fair and up to date. We reserve the right to refuse orders where, the info which have been wrongly entered, mistakenly by our staff, where the details of price, description and other issues we feel are not fair. This, however is not the case, but applies also to Out of Stock, rejected cards and fraudulent orders. If a problem with an order verifies the customer will be contacted as a matter of urgency by our staff, and in the event that the customer cannot be reached, for whatever reason, he/she will be invited to contact Radiomodelli by Ethnik through its reference that can be found, easily and friendly on our site. We do our utmost to guarantee data protection, payments’ safety and timeliness of deliveries through Radiomodelli by Ethnik. We guarantee peace of mind!. However it is important also to reiterate that we do not take responsibility for possible losses caused by the unauthorized access of third parties to the personal data supplied by you to Radiomodelli by Ethnik. This could be during the access or during the order’s conclusion on our site. We reserve the right to change the prices without prior warning (obviously not when the order is in process). All the prices are VAT inclusive (where applicable) at the current rates. In the case of goods problems that are down to our negligence we can do one of the following: We can provide to repair it, if it is a unique item. We can change it, swap it with one with the same characteristics. Or if any of the above is not possible we can refund in full the sum spent straight away. The inappropriate use, intentional damage or negligence on the client’s side. Usual “wear and tear” of the product, if not within the parameters, life span declared by the manufacturer. If it is impossible to prove the malfunction, defectiveness stated by the claimer.